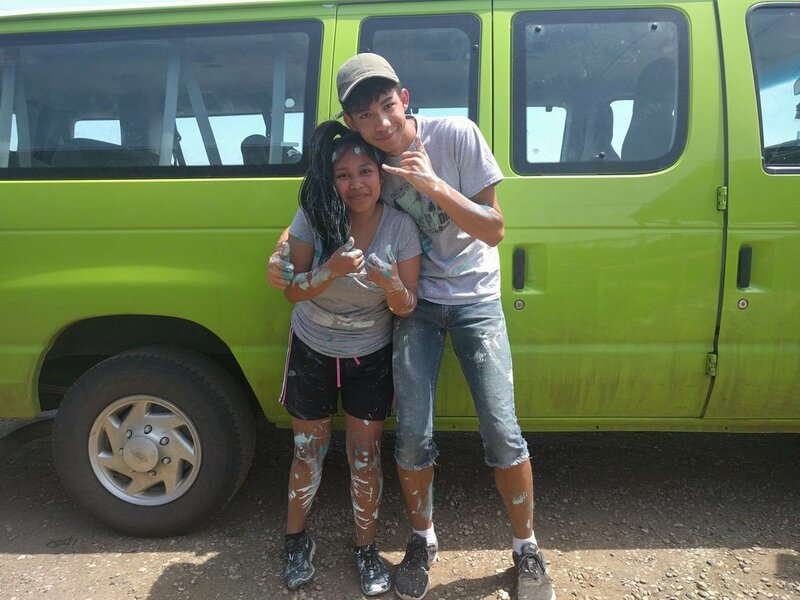 Below is an update from our youth volunteers from the Plymouth UCC in Lawrence, Kansas, who have returned to volunteer with us on the Cheyenne River Reservation for their third consecutive year! 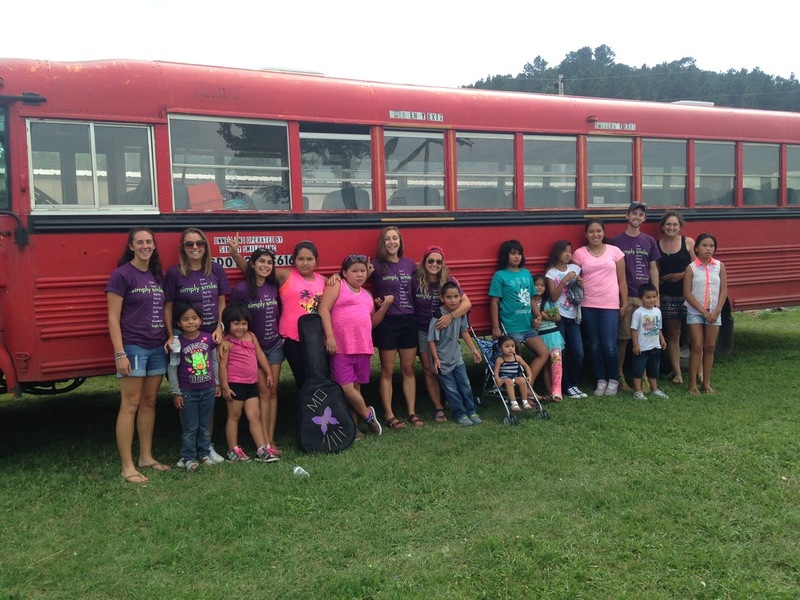 High school students from the Plymouth Youth Group from Lawrence, Kansas joined the staff and interns at Simply Smiles in welcoming about 30 children from the Cheyenne River Sioux Tribe Reservation at the start of a week-long summer camp in La Plant, South Dakota. "[The children at camp] were much more willing to be involved and much more open,” said Calvin DeWitt, who is in his third year of volunteering in La Plant. In previous years, the volunteers needed to work much harder to form relationships with the kids, showing the strides made by Simply Smiles on the Reservation. On Tuesday, four days into our adventure in La Plant, South Dakota, we raised the roof -- literally. With Simply Smiles’ founder, Bryan, spearheading the effort, Plymouth volunteers raised three roof trusses on the new volunteer bunkhouse. One group of volunteers moved a roof truss to the top edge of the framed walls and handed the truss to nine members on scaffolding inside the new structure. It was an amazing team effort, just as much of this week has been. Cooler weather moved in on Tuesday, and while we felt a few sprinkles, the rain held off and lower temperatures made everything easier. In the mix was: a two hour basketball game featuring volunteer Alex Stark vs. the teenage women of La Plant, Liam McKinney and his first power tool, Stefan Schuetz and his team installing OSB sheathing, and Rylee Roberts documenting our trials and successes on film. As Jacob Schepp noted during Tuesday night reflection - Tuesday was a five star day! Volunteers Siona and Ruby work on painting the inside of a newly-renovated home of a community member. Epic bubble making at summer camp! We couldn’t feel our toes! But we stayed in the cold water of the Missouri River nonetheless. Why? Because 30+ Lakota youth wanted to splash, swim, jump from the dock, take underwater photography with a Go-Pro, and use their imaginations and new-found friendships to fill an amazing afternoon of camp! On the way home, a six year old fell asleep on volunteer Lourdes’ shoulder and the three Jaiden’s (just one from Plymouth) bonded as they shared a seat on the big red bus. The river day was a great reward after a full morning of hard work. One team, led by chaperone Mindy Downs, delivered new flooring to a resident’s home, and completed all of their painting projects except the kitchen! A few of our volunteers, including Siona, Rollin, Jaiden, Olivia and Grace, came back to the Community Center with a bit more paint on their bodies and hair than on the walls. Another team hoisted 16 roof trusses into place for the largest roof in Simply Smiles La Plant history, on a new volunteer bunk house! Thanks to Margaret’s awesome communication skills, Peter’s height, and the muscle of Maleena, Schepp, Gabe and many others, it was an amazing illustration of teamwork! If you have a job that is dependent on Mother Nature, you learn to be humble. Good farmers and food growers acknowledge that they are merely facilitators and caretakers for bigger, natural forces. Sure, we can plant the seeds and hope to reap a harvest and a small profit, but much of it is out of our control. What is in our control: How we choose to show respect, reverence and patience for the human and biotic community that surround and are a part of the garden. The easiest part of my job, especially coming from a commercial growing background, is showing the quantitative value of the garden. I’m proud to say that, during the 2016 season, we produced more than 700 pounds of food. That’s a lot of vegetables! 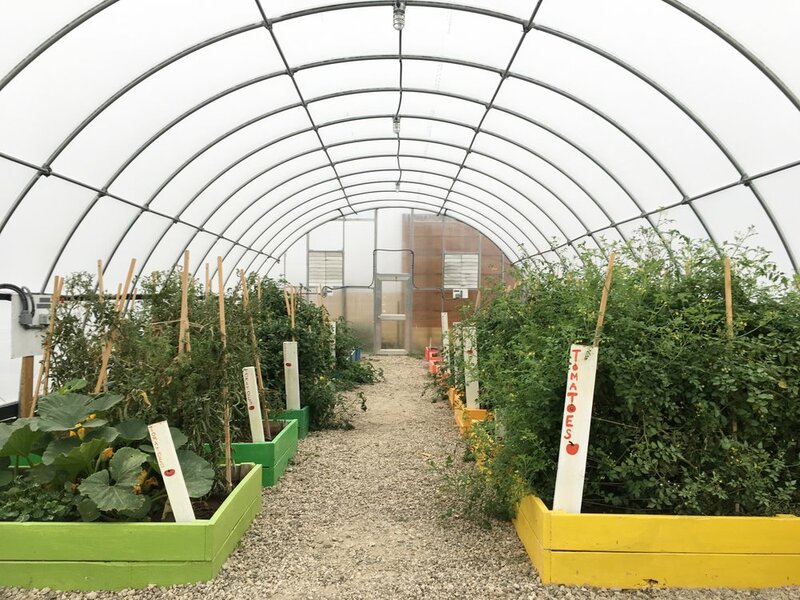 This growth in production should be celebrated, especially watching the La Plant Grow Its Own Food project transform from a small, tomato-growing contest to a quarter-acre micro farm because of the many, generous hands of the Simply Smiles community. But, how do I capture the most rewarding part, or the intangible benefits? I’ve seen a shift in some of the adults, whom I first met when I was a volunteer in 2013 when they were shy and slightly standoffish to now, when they approach the garden with great interest and pride. 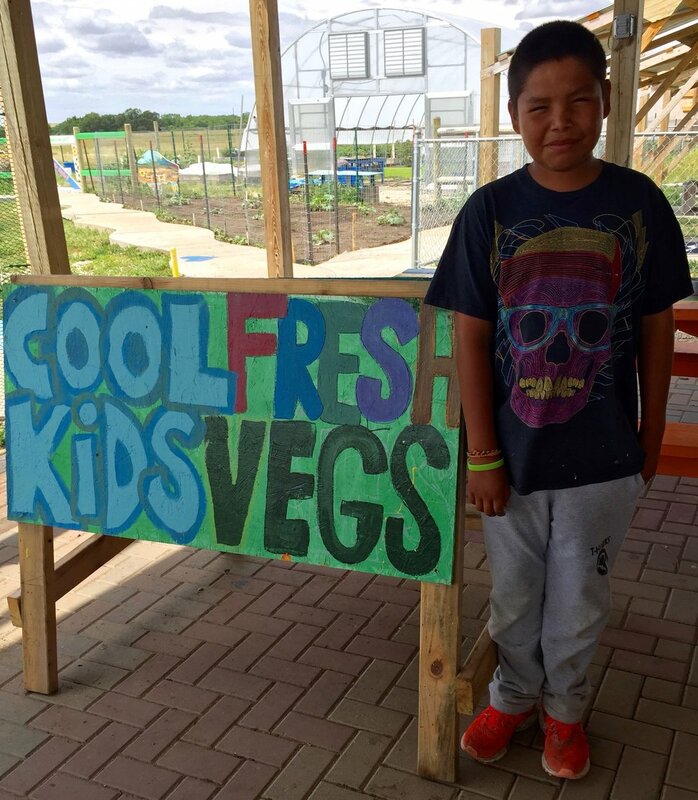 I’ve had the opportunity to mentor and work alongside many inquisitive, spirited kids who get truly psyched about working in the garden, selling the produce at their weekly farmstands, or leading garden tours, gaining authority and confidence with each passing week. When I arrived in La Plant to expand the garden project in April 2014, the original plan was simple: Build a garden in a central location, and people will come. Well, turns out, it was and remains not that simple. This is not to say that “going with the flow” became the adopted mantra - far from it! By just being in the garden space regularly, people - adults and youth alike - have shown interest in and embrace the garden in their own unique and meaningful ways. Pace and patience are two concepts that I’ve come to appreciate because people are showing up, they are eating the food, and they are participating. La Plant Grows Its Own Food farmstand series 2016! People in town attended the nine farmstands that we held throughout the course of summer and early fall. Individuals asked how to use vegetables, and neighbors shared recipes. A young girl saved up some money to buy a cookbook at the farmstand. She wanted to test out some new recipes for her family. 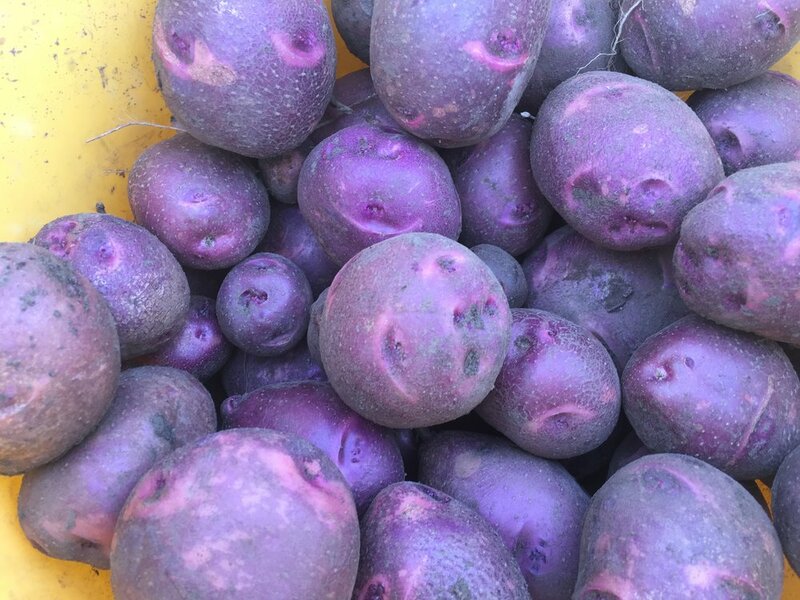 In late summer, after a townwide meal, I watched a young father walk around the garden with his toddler son on his shoulders, pointing out different vegetables and flowers. A man quietly stopped by the Community Center to learn more about a seed packet that he was given. He planned to plant the watermelon in his garden, but wanted to know if the fruit would grow in time for a family reunion in late summer. A grandmother harvested young carrots with her granddaughter, both with wide smiles on their faces. A young couple invited Zach and me to see their new garden in their backyard. We casually swapped tips and laughs, as you would with close friends. During garden class, a girl said, rather casually, that the garden makes her feel safe…and less bored. 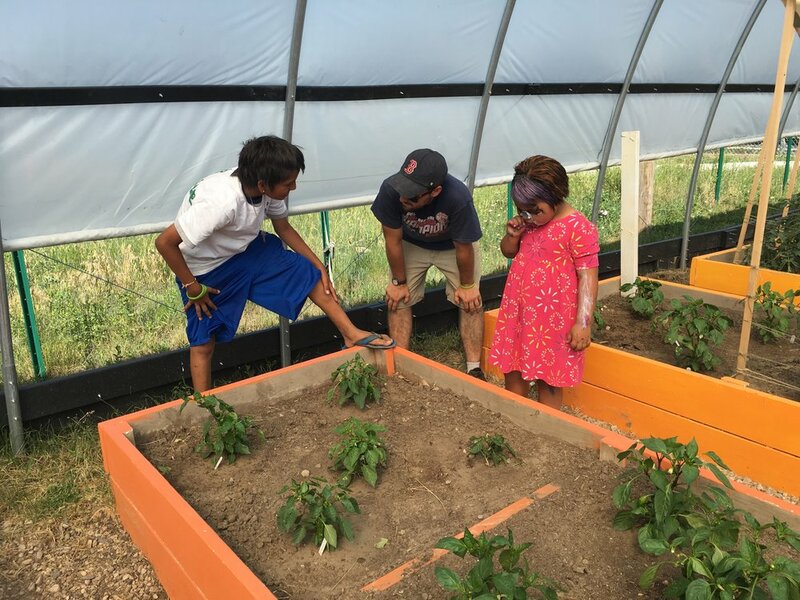 One of the youth garden assistants from the Reservation planted a garden around the perimeter of his house, providing weekly updates on the the height of his growing sunflower and asking when the seeds would be ready to harvest, eat, and save for the following season. The garden is flourishing because presence - physically being there - is the root of the Simply Smiles philosophy. You can’t run a garden from a desk in Connecticut, and I’ve been fortunate that I have spent a significant part of my three years with the organization living and working on the Reservation. Every time I latch the garden gate, I leave the space feeling immensely hopeful. The garden has morphed into something more than the physical space of raised beds, a greenhouse, and a pumpkin patch. I’ve witnessed, quite visibly that kids and adults alike are seeing and planning for a future. 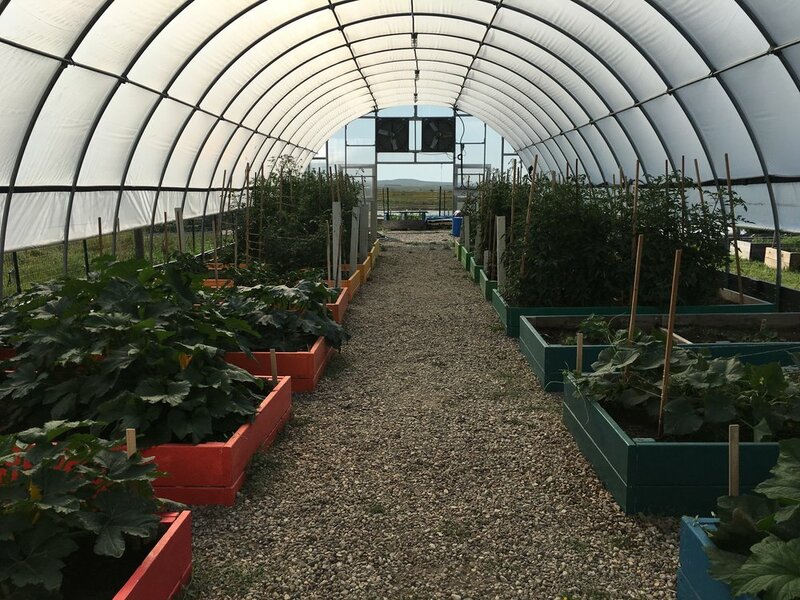 It's with the support and generosity of members of the Simply Smiles community that we have a garden and greenhouse, that these food growing initiatives can provide an electricity, warmth, and make growing local food on the Reservation a point of pride, celebration, and serve as a visible and exciting symbol of hope and change. Thank you! Kids sowing seeds in the spring! Kids showing volunteers how the peppers grow! An elder harvests cucumbers in the greenhouse! The greenhouse, in full bloom! The greenhouse aglow in the evening! The greenhouse aglow as the sun sets in La Plant! Hiding in the sea of tomatoes! The greenhouse, full of life, in November! Today's Field Note is from Jessi Wilcox, one of our amazing, incredibly hardworking summer interns, a dedicated volunteer, and a recent college graduate from the University of New Hampshire. Jessi has spent a significant part of her summer with us on the Reservation. Her insights reflect her commitment to the children of La Plant and her thoughtful outlook on how she plans to bring her experience home. People say it’s the little things in life that count, which can sound a little cliche, but the more life experience I gain, the more I realize how much truth this statement holds. I am overwhelmed with how to put into words what this summer has taught me, and how much my time as an intern on the Reservation has meant. I am flooded by memories of “little” moments that have each played a role in making this summer so meaningful. There are so many stories and emotions I could share, yet I still find myself trying to find a way to connect these moments to a broader audience. How can I make each of these little things that mean so much to me, mean something to my friends and family when I get home? How can I relay my experiences so that it will reach them, or inspire them to get involved? As a recent college graduate, most of my conversations with people have revolved around some sort of question about my next steps in life. Leading up to graduation, my friends were applying for jobs to start in the summer and getting themselves ready for their next step into a career. I knew my next step had to be getting more involved with Simply Smiles. I was excited to finally have a summer where I could be on the Reservation for an extended period of time and truly immerse myself in the culture, community, and absorb the experience. Jessi, always a leader of piggy back rides and a friendly face at camp! This excitement stemmed from previous years of being a volunteer with Simply Smiles. I first came out to La Plant for a week during the summer of 2013 with a group from home. After such an amazing time, I knew I had to come back, so the following summer, I did! This time, I participated in the Simply Smiles Win A Trip contest. I worked hard to fundraise so that I could not only contribute to the organization that I felt so strongly connected to but also so I could revisit with old friends and lend a helping hand once more. I was fortunate enough to be one of the winners of the contest and had the opportunity to join the Fairfield University volunteer group for a week in August 2014. Returning to the Rez with a large group of strangers was an awesome experience. It was exciting to see the enthusiasm brought by a big group of college students; there were new ideas and lots of energy to carry us through the week. My involvement this summer as an intern has taught me a great deal. It can sometimes feel overwhelming getting new volunteers every week, but what I have taken from this is to appreciate the new perspectives that they bring, as well as the new energy and interest they possess. It has been amazing to watch the dynamic and relationships built among volunteer groups, staff, interns, community members, and kids. The conversations at town-wide meals, the games and tickles at camp, and the teamwork that goes on at the work sites proves to be a learning experience for everyone involved. I have also learned a lot about myself and reflected about who I want to be, and where I want to go from here. Something that got me thinking about this was a brief and silly moment with a 4-year-old boy at camp. When he turned to me with a mouthful of spaghetti and a giant grin, blurting out, “Hey! What’s the big idea? !” I couldn't help but smirk at what had just come out of his mouth. Of course, I replied with, “To tickle you!” which was followed with laughter and big smiles. But, when you actually do think about it, what is the big idea? This so called “big idea” revolves around kindness, genuine interactions, real, honest conversations, open-mindedness to new perspectives, and sharing stories and moments with all kinds of people. These are the things that make a difference, no matter where we go in life. It is in these moments that I've formed new friendships and shared memorable experiences. Each town-wide meal, day at camp, trip to the Missouri River, mornings at the worksites, the powwow, and wopila have given me new stories to tell when I return home. Through these stories, I hope to teach others about Lakota culture and to get involved. These stories have the ability to give a voice to the people of La Plant and strike an emotional chord and, hopefully, action in the lives of family and friends back home. As a return to the East Coast, I am reminded that it is the little things that will have a big impact. I have learned that getting a smile out of a child, or a hug out of an elder may not seem like a big deal, but it is these things that move us forward down a positive path. Thank you, Simply Smiles, for capturing the essence of this and continuing to impress me with your love and sincerity. Field Notes from the Reservation: First Church of Stamford, take two! We often say one of the most challenging elements of volunteering at our project sites is how to best articulate all of the things that happen over the course of day and to share these occurrences with friends and loved ones back home. While we do follow a schedule and have plans for the week, there are a number of events - small or large - that can make the volunteer experience even more memorable. In this Field Note, our friends from the First Congregational Church of Stamford, Connecticut try their hand at describing parts or reflections from their days, with snippets from numerous volunteer perspectives! We're happy to have the Stamford crew back on the Reservation this week - their second volunteer experience with us! Intense puzzle piecing and getting crafty at camp! The latest Field Note is brought to you by Dennis Cullinane, a teacher at Deerfield Academy in Massachusetts and leader of the student group that is volunteering with us this week on the Reservation. When I embarked upon my journey west to La Plant, South Dakota with Simply Smiles, I was under the impression that I understood what current Native culture was like, and the tragic history that came to shape it. To be sure, some of my understandings were accurate, and in fact, as I traveled here and during my first days in La Plant, I read The Last Stand, a book about Native and U.S. government relations leading up to the Battle of the Little Big Horn. I had also taught and interacted with Native students back at Deerfield Academy, had studied the public health issues of Native Americans, and growing up as a Democrat in Massachusetts, I was sure I was well armed to understand the people I would be helping. As the days in La Plant have unfolded though, I’ve begun to understand better how incredibly complicated, and dare say, sinister, are the history and current issues facing the inhabitants of the Cheyenne River Reservation. And perhaps most importantly, I now have a tremendously ingrained sense of how scheming, poverty, neglect, and ignorance can trap a people, year after year, generation after generation, in a cycle of despair and surrender. Dennis, right, works with Jeremy from La Plant to build the foundation of a wood pellet shed at the new homes. Where I came from, unemployment is lower than virtually any country in the Western world, public and health facilities are equally world-class, and a greater educational experience than the generation before is not just a hope, but a certainty. Little kids grow up wanting to be doctors, lawyers, astronauts, marine biologists, or president of the United States. Even African Americans, a cohort that has suffered tremendously at the hands of American society, now can tell their children that they, too, can be president. Unfortunately, the reality I left either nominally exists, or does not exist at all on the Reservation. To the great credit of the people who have lived here for generations, and despite all that they as a living historical lineage have endured, they are warm, friendly, thoughtful, profoundly philosophical, and deeply proud of their heritage. Indeed, I have been incredibly impressed with the indefatigability of their spirits in their daily lives, but I cannot help but feel a need to do more. Working side-by-side: Volunteer Katie works with Shane of La Plant to frame in a bathroom ceiling on a new home. Not more in the simple sense of giving money, or goods, or et cetera, but to help kick start the next generation so that they can exit the vicious cycle in which they unknowingly find themselves. Indeed, lending them the lens to see another, possible, happier and more constructive future can be as simple as letting them know somebody else cares about them, wants them to succeed, and in some instances, expects more of them. This knowledge is exactly what will send them - especially the children - careening out of cycle in a wonderfully chaotic tour of life that most of us, their neighbors, take for granted every day of our lives. A fire was smoldering in me when I committed to the week here at Simply Smiles, smack dab in the middle of South Dakota. That smoldering ember is now burning brightly. I now see the face of my own happy, eager, well-educated, well-traveled and wonderful 14-year-old son in the eyes of every kid I see here, and I shudder at the thought of him giving up on his future and being sucked into a cycle of generational despair. The kids here need a lens, or a higher hill to stand upon, or whatever metaphor you like, so that they can see further and do more with their lives. I now understand life here, but sadly, only a little bit better. Read other Field Notes from the Reservation! All smiles at the new home sites, as we near completion of the exterior facades! This is Palmer Trinity’s second time in La Plant, and we are extremely excited to be back! We have been working on Ford and Kee’s houses and have made significant progress throughout the week. All of us have been working hard and putting in our best efforts to complete these homes for the people of the Lakota community. In addition to all the wonderful work we have done, the relationships we have built with the other volunteers, interns, staff, and especially the community have given us more than we could ever imagine. The sense of family, pride, and love that Simply Smiles has created within the walls of the Sam D. Horse Community Center has not only brought this community together but has also produced a unique bond among us as students. Superhero Day at camp, complete with mighty t-shirts and capes! Among the PTS group, there are four students who are returning for their second volunteer experience. They had such vivid and wonderful memories of their conversations with Barbara, playing basketball with Kayson, and reading with Madison on the playground spiderweb. Upon return Sofia, Delaney, Miguel, and Lauren were apprehensive about how they would be received by the children and elders of La Plant. On the first day of camp, Jayce, Lulu, and Stayce all remembered the four returnees by name. In that moment, Lauren, Sofia and Delaney were brought to tears as they realized that the impact the kids had on them was just as big as the influence the four volunteers had on the kids. When we arrived on the Reservation we heard stories of how the Lakota children originally had no aspirations in life. This week, Hope - and many other students from our group - spoke with the children and were happy to hear them make references to graduating high school, attending college, and even aspiring for careers after they finish their schooling. Sergio, center, leads a garden tour and taste test of the garden! During camp, kids have expressed desires to become anything from professional basketball players to superheroes. Sergio, for example, has demonstrated an interest in pursuing a career in agriculture. These very ambitions are testaments to the positive impact Simply Smiles has had and continues to make on this community. Throughout our trip we have befriended the children, heard the horrific stories of what the elders went through during the“Boarding School Era, and felt accomplished after finishing the framing, soffits, and mixing of cement to build houses for the deserving families. Every experience is meant to change you, and this experience is most definitely changing us. No single week’s worth of work can provide a lasting antidote to the forces of poverty, racism and broken relationships that have plagued the Cheyenne River Reservation for centuries. But, there is hope; there is measurable and visible change taking place, and Simply Smiles is here to stay. Now, Plymouth Youth Group of Lawrence, Kansas is a part of this consistent presence in the Cheyenne River community of La Plant. Plymouth Leader Eleanor (second from left) speaks with the housing recipients - Kee, Ford, and Elvis - at the housing site of Ford (second from right). Cameron, along with her fellow Plymouth Youth volunteers Cole Phillips, Abby Jackson and Andrew Anderson, came to South Dakota for similar reasons. For Abby, who made the trip north from Kansas to the Reservation in the summer of 2015 as well; “I wanted to see the progress that had been made in a year, to see what kind of impact we possibly made from being here last year. The reality of experiencing the systemic dysfunction that has existed since the creation of the Reservation system can be challenging, especially when one sees the effects on individuals with the least control over their present circumstances — the children whom Plymouth Youth have gotten to know through Simply Smiles’ day camp. Personal piñata making at camp! Behavioral issues at camp — particularly incidents of bullying between select children — do not emerge from a vacuum. They are often the result of the pain that runs deep from years of systematic and cultural disintegration. This in no way excuses or condones bullying — Simply Smiles has a zero tolerance policy for such behavior — but witnessing the legacy of history is an important thing for Plymouth Youth to experience and grapple with firsthand. The work with the children is perhaps the most important project of any volunteer group that comes to La Plant and Simply Smiles. 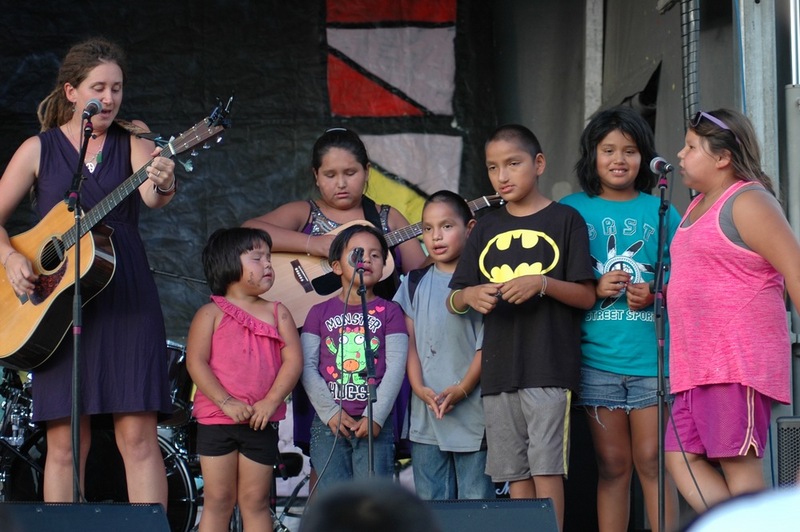 The children are the foundation and the future; reminding the kids on the Reservation of their importance—of the value of their hopes and their dreams, of their right to a place in this world—is vital. And the hundreds of Simply Smiles volunteers who travel to the Reservation each summer can provide the consistent presence necessary to enact change. Taking great heights to build strong, safe, secure homes: Thanks to our amazing volunteers and interns who worked alongside Bryan to put the roof on Ford's new home! Erin Scionti first volunteered on the Reservation in 2013 and returned as an intern in 2015. She joined Simply Smiles staff members Zach and Sam and a team of medical staff during our fall medical clinic and food distribution program in Mexico in November. Below, Erin reflects on her experiences. I was beyond ecstatic when I was offered the opportunity to travel with Simply Smiles to Oaxaca, Mexico to help with the food and medicine distribution in the village of Santa Maria Tepexipana (SMT), and to assist Dr. Gil L’italien in testing stool samples to determine the prevalence of various intestinal parasites in that region. I am currently studying public health at Southern Connecticut State University, so this trip encapsulated everything that I had learned so far in the classroom. It made the classroom lessons tangible. I could feel and see the impact of the countless hours spent studying textbook material. Erin, right, works alongside Simply Smiles board member and epidemiologist Dr. Gil L'italien to test stool samples for the presence of parasitic intestinal worms in Santa Maria Tepexipana and its neighboring communities. We arrived in Oaxaca as a spirited group of eight hard working and dedicated individuals, ready to take on the crucial tasks ahead. Coming into the week, I already had a strong understanding of what was expected of us as representatives of Simply Smiles. I served as an intern with Simply Smiles this past summer on the Cheyenne River Reservation in La Plant, South Dakota. There, I saw the attentiveness, flexibility and love put into each project and person by the staff of Simply Smiles. Though the tasks were drastically different in Oaxaca than those I worked on in La Plant, our mission remained the same: to inspire hope. On our first day in Oaxaca, we visited Casa Hogar Benito Juarez, the children’s home that first inspired Simply Smiles. I was a bit nervous at first that I wouldn’t be able to connect well with the kids because of our language differences. But, I learned quickly that language was the smallest of barriers standing in the way of children and fun. The kids warmed up to us immediately as we colored, ran around and enjoyed multiple servings of their favorite ice cream. Seeing the way the kids at Casa Hogar interacted with us reassured me that a language barrier wouldn't stop me from connecting and building relationships with the other children I would meet throughout the week. The next day, we departed on an eight hour drive through the breathtakingly beautiful roads of Oaxaca up to Santa Maria Tepexipana, a small village in the remote mountains. When we arrived, I was expecting to see a town in despair but instead I saw quite the opposite. Though poor and many stricken with illness, the people of SMT were some of the warmest people I have ever met. I was so fortunate to meet these kind-hearted individuals, which reaffirmed that happiness is not a measurement of material worth, but rather, a reflection of how one values life. People in SMT are simply happy to give love and be loved. Families took pride in their home and their culture, they looked out for one another and willingly took less to give others more. Their generosity never ceased to amaze me. One family cleared out an entire half of their home so that we would have a place to sleep and eat during the week. Like the children at Casa Hogar, the kids in SMT instantly became our best friends, hugging us, and holding our hands upon moments of our arrival. I was pleased to see that, once again, despite our language differences, we were welcomed with open arms and smiling faces. During the three days of the food distribution and the medical clinic, I worked closely with Dr. Gil Litalien in examining stool samples to track the prevalence of intestinal parasites in the SMT region. We looked specifically for Ascaris, Trichuris, and hookworm. We gathered samples from 113 children who came through the food distribution program with their families. After careful examination, we found a 21.2% prevalence in the entirety of the region, compared to a 31.4% prevalence in 2014. This 10% decline is a remarkable confirmation that the work Simply Smiles is doing to treat and prevent the spread of infection is noticeably working. By distributing Abendezol at each food distribution and educating the community on the importance of hand washing and wearing shoes out side, the prevalence of intestinal parasites in the SMT region has drastically decreased. Erin, during her time as an intern on the Reservation in 2015. Her positive attitude, willingness to lend a hand wherever needed, and sense of humor are among her many qualities that make her a favorite in the La Plant community! As the week continued to run with ease, thanks to the hard work of our energized and committed team, I grew more and more attached to all the smiling faces of the children and their families in SMT. The people I met in this one small village in Oaxaca, Mexico were so thankful for the help we brought them, but I feel what they gave me in return was an even greater gift. They gave me their friendship. Though our work here is not complete, I returned home knowing that the people we helped this week would continue to grow healthy and remain happy. Interning for Simply Smiles has taught me a great deal about myself and the world around me. I’ve learned how to be a valuable part of a team, how to be a strong leader, how to love and care for everyone I meet and most importantly how a simple smile can go a long way. Tell us what Simply Smiles means to you! Respond with a comment below, post to our Facebook page, Instagram a photo, or tweet @simplysmilesinc using the hashtag #SimplySmilesmeans. Today's Field Note is from Emma Russell, who is in the special category of super volunteer. In addition to her service in Mexico, Emma has shared her time and talents with Simply Smiles on the Cheyenne River Reservation beginning in 2008. Emma has parlayed her passion and on-going commitment to education to organize two college tours for middle and high school-aged students. The most recent trip in October 2015 was to the University of South Dakota, where nine female students from the town of La Plant, ranging from 7th to 12th grade, joined Emma and Simply Smiles staff member Alex on a two-day tour of the University. Below, Emma addresses the complexities of telling stories that honors relationships that she's made on the Reservation. Although I have had the profound privilege of being a part of Simply Smiles on the Cheyenne River Reservation since some of the very first days, I have yet to write anything about my experiences until now. A big part of me feels guilty and irresponsible for neglecting to put my many thoughts into written words, yet I have been hesitant for a reason. To begin, I tend to be a perfectionist when writing and the weight of telling this story always seemed to leave me paralyzed, unable to write for fear of saying the wrong thing, or sharing something that is so grand and deep I could not possibly do it justice. From my very first months on the Reservation, I was acutely aware of my ignorance of this new place. I was truly an outsider, and this made telling the story uncomfortable. This, paired with my shock at the manner in which our nation’s gross past against Native Americans persists on reservations today (and my oblivion to it), made writing something adequate and all-encompassing feel impossible. Now, less ignorant, but still a world apart from the lives lived by those on the Reservation, another thing weighs on me: friendship. I will never fully understand what it is like to be Native and live with these heinous injustices that resonate loudly in present day. However, the countless times that I have seen children whom I have watched grow up for the past 7 years (and who are still children) question the worth of their own lives, I am equally as loudly reminded of this direct and tragic correlation between past and present. In today’s world, death and depression, particularly among native youth, are devastatingly substantial parts of the current narrative of reservations across America. Furthermore, these narratives are but a whisper among the majority of the country—if even that. I have wrestled a serious conflict within me since setting foot on the CRST for the first time six summers ago. A conflict that involves telling a story that is certainly not mine to tell, but if I do not tell it, I become a part of the problem that has persisted for generations. Which leads me to where I am today: staring at my computer screen with a profound love for all of my friends in La Plant, attempting to strike a balance with my words that maintains the level of respect they deserve, while still bearing the weight of a persisting injustice that I (both directly and indirectly) own. Every year, I go back to live in La Plant and my heart breaks on multiple occasions. I am also, however, overcome with joy and hope for the future of the kids and teens in La Plant. While my recent trip in October was not without its heartbreaks, I want to share with you the positive anticipation that resounded while taking a group of nine incredible young women on the second ever Simply Smiles College Tour. I have always believed that, more than almost anything else, education is a catalyst for social change. The young population of La Plant deserves to not only wonder, but also KNOW that college is a part of their futures if they so choose. On this trip, I was impressed over and over again by the girls’ questions, enthusiasm, and dreams. The girls asked about pre-medical programs, nursing, art, and veterinarian programs. They explored new concepts at the college fair such as anthropology and sociology. I reveled in the look of astonishment and admiration when they told faculty members from different programs that they were only in seventh/ninth/tenth grade. They displayed a maturity I have not seen in many people my age. I was ecstatic when the one senior on the trip made sure they attended the scholarship seminar upstairs and then filled out an application on the spot. The girls displayed the confidence and self-awareness to sit down at the big piano in the crowded student center and play songs they learned at music camp for all passing students (very well, I might add). They inspired everyone—from the faculty of the school, to the young women of the Coyotes Division I basketball team, to myself, to each other—with just how incredible they can be and what that means for their futures. These young women demonstrated a self-confidence, excitement, and air of inquiry that I had not before felt or seen on my trips visiting schools as a prospective student…and some of them are only 12 years old. The goal for these Simply Smiles college trips is not just to ignite in the students the thrill and positive anticipation for their futures, although it is critical. The youth in La Plant exist in a world where many have lost their peers, many under the age of 15, because young adults are constantly left to wonder if their lives are worth something—worth living. To combat this reality, this trip also promotes experiences that allow these young teens to realize just how extraordinary they are - something that we and the other adults in their lives are reminded of on a daily basis, but that can sometimes be lost on them. I would say that it remains unfathomable to me that the current situation for Native Americans pervades as tragically as it does today, yet it is evident each time I set foot on the Rez. There is no question about the effect the past has had on the present situation. Native children ARE suffering as a direct result of society’s attempt to stifle their culture, their beliefs, their language, and rob them of their land and resources. We as a collective society need to continue to own those mistakes made and those that continue to be made and fight them. While it all still saddens me and there is still a very long way to go, I feel exceptionally lucky to be a part of something that is not only trying, but succeeding, in doing this one college trip, one smile, and one friendship at a time. Today's Field Note is brought to you by Fairfield University students and first-time volunteers Elena Berube and Becca Quillard. This is the second year a student volunteer group from Fairfield has joined us on the Reservation, which is all the more special as it is Zach and Alex's alma mater! It’s 2:30PM and the big red bus is on its way to big things. You can hear the ice cream truck music playing, the daily signal that camp has started. You can see the kids running to the bus, eager to get to the community center. The bright colors all around the community center symbolize the happy atmosphere that this place creates for the kids. As a volunteer, this moment is a reminder of why we are here. Over the past four days, we have been working on various construction projects for some of the community members. When we started these work projects on our second day, we hadn’t met any of the community members. Once we finally met them, it meant so much more because there were intentions and emotions behind our work. Spending the afternoon working with the kids at camp really helps us to reestablish the purpose of being here, seeing how the work we are doing has the power to improve the lives of the kids and their families. As college students we may think that we have been exposed to more knowledge, but we have found that the wisdom of our new friends in La Plant far exceeds our understanding of life. In four short days, we have learned more from them than we can in a typical classroom setting. A La Plant resident talked about how valuable a college degree is, but reminded us that “an education means nothing if it is artificial, missing parts. It’s like math without the zeros.” For us this showed how important education is, but even with the degree, it’s what we do with it that matters. We’ve found that the children are opening up to us now that we have spent more time listening and playing with them. We hope that they understand the importance of education and recognize their power to change the world. Of course we are are encouraging them to become fellow Stags! It’s now 5:30 PM and the big red bus is pulling out of the Simply Smiles parking lot, dogs chasing alongside. The kids are begging us to swing longer, paint another face, or join them for a ride. They leave happier than when they first arrived, eager for another day at summer camp. Learn more about the Reservation! Field Notes from the Reservation: Settling in, adjusting to temperatures, and muddy play day fun! The following Field Notes are from Silver Lake Conference Center and Essex Congregational Church volunteers Joanne Taber and Katie Holden. We arrived on Saturday evening to a 100 degree Big Red bus ride. The 19 of us settled in and went to bed in the community center after a delicious dinner. On Sunday morning, we all woke up an hour early and headed off on a tour of the Sam D. Horse Community Center and the town of La Plant. That evening, we enjoyed meeting the townspeople at a town-wide meal of macaroni and cheese (secret ingredient: cauliflower!). The night concluded with a rousing game of kickball before dark. Monday morning was our first day of work and camp. The temperature dropped to 60 degrees with clear skies. We worked on the edge of the basketball court, painted the side of the rock wall, continued work on the pellet sheds for the new houses, started construction of the garden shed stairs, cut out two buffaloes, and completed other odd jobs. Tuesday, we woke up to pouring rain, Gumbo mud, and fallen temperatures. In typical Simply Smiles manner, we adjusted and had a fun and flexible day. Progress was made on all jobs with a focus on painting rooms in new houses, new road signs, buffalo models, and the final rock wall side. Construction started on the new and improved movie screen that has been in the works for a year! We look forward to the next three days as we continue to build our new relationships. Make an impact - volunteer with us! 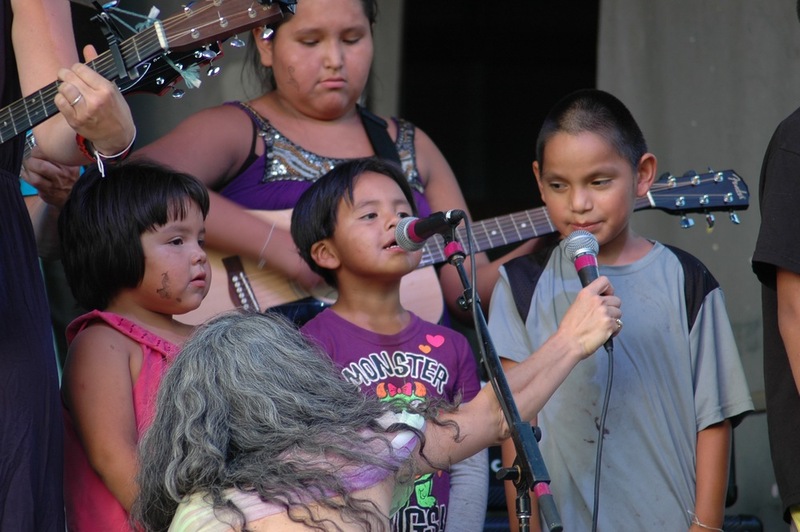 Field Notes from the Reservation: No rest for the weary! Today’s blog posts are brought to you by volunteers Kathy West and Stu Constantine from First Congregational Church of Stamford. We arrived on Saturday evening and acclimated ourselves, going to sleep with full stomachs and a big orange moon in the night sky. We’re all sleeping together on the floor of the community building, and thankfully no one snored too loudly. Sunday was a beautiful day, not too hot with a nice breeze and bright blue skies. After a pancake breakfast we got a full tour of the community center. We learned about the history of the community center building, and how it was fully renovated a few years back. The land for the community center was donated by Sam D. Horse several years ago, with hopes that it would help to create a gather point for youth and their families in the area. We learned about the garden, and the plans for expanding the high tunnel structure into a full greenhouse. We also got a tour of the new horseshoe pits, which are built to official specs. Later, we toured the town of La Plant, learning about the history of the community and some of the challenges faced by the people living here. We saw the house currently under construction, and also saw one house that will be completed by the end of the summer. After lunch we broke into teams and went off to various project sites to make some progress, and to get ourselves set up for a full day on Monday. For those who thought we wouldn’t have enough to do, we’ll be putting up a ceiling and interior walls in the new house, building two storage sheds, a climbing wall, a new walkway, and preparing the ground for a new playground, among other things! Sunday night we had a community dinner, with several local families joining us for grilled chicken and salad. After dinner the kids played a huge game of kickball as the sun set while the older folks played horseshoes and traded stories. We’ll sleep well tonight, and tomorrow will be a big day. Building soffits and hat tracks (hope you are impressed with my technical language) on one of the new houses being constructed for a family. Also, very importantly, it was the first day (for us) for the Summer Camp with the kids. We were very ambitious with our arts and crafts and games planned. We picked up some kids in the Big Red Bus and others showed up from what seemed to be from out of nowhere. The kids made lanyards and friendships bracelets, colored, played basketball and kickball, and a multitude of other “stuff” too numerous to mention. At the end of our exhausting day, Zach announced that we would be rewarded with a trip to the mighty Missouri River. This brought rounds of hoops and hollers and applause. Wow, what a trip! Nearly 25 miles away through constant and abundant rolling prairie hills with scattered cows and horses but very, very few houses or people. Watching the grown men and women of our churches (and yeah, the youngsters too, but this is normal for them) run down to the water’s edge and plunge in was quite the sight - something we'll always remember - just pure joy and fun. Today’s unique Field Note is brought to you by Lucy Burr and Stephanie Stewart, both first-time volunteers from Essex and Farmington, Connecticut respectively. They are part of a mixed group of volunteers who have met for the first time here in South Dakota! Today, they reflect on what they've learned from their first few days with us here in La Plant. The dedication of the Simply Smiles founder and staff is amazing in its work ethic, cultural respect, resolve, patience, determination, kindness and inspiration. The work to be done in La Plant is hard, emotional, uplifting, and so much more. We came prepared to use our hands. We are surprised at the pain in our hearts. Our impatience urges us to give and do, which is faster than teaching. We are frustrated by OUR people’s political/administrative mistreatment. 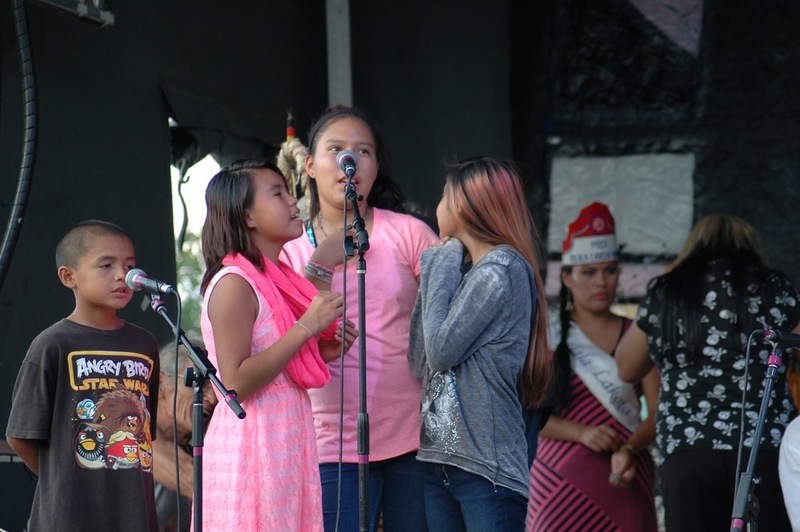 We enjoy celebrating this community’s dance contest winners at the annual powwow. The kids are eager to see the smiles greeting them at camp, ready to give them our full attention in a friendly place and spend a few hours on a summer day. Field Notes from the Reservation: "We still have so much work to do"
The latest Field Note is brought to you by volunteer Christy Wright, Director of Youth Ministries at Sudbury Methodist Church and is working this week with her Gales Ferry friends. One of the most difficult mysteries of life to understand is the tension of celebration and sorrow, deep joy and great mourning. We admit that this world is beautiful, but we also acknowledge its brokenness. We are working toward a better life, but we still have so much work to do. At the airport, Sam met us with the famous big red bus, bearing the love letters of previous volunteers inscribed across the ceiling. We pulled out of the parking lot, dropping the bus windows with the breeze pouring in. Even the air smelled different. It’s rich and organic, musky and heavy with life. With a folksy soundtrack emanating from the crackly bus speakers, we passed through fields of corn, soy, and sunflowers; giant cylindrical bales of hay dotted the landscape, and telephone poles punctuated the scenery like long, narrow picture frames. We could almost perceive the clouds’ movement as they shift shapes and drift lazily against the deep blue sky. The sun began to set behind us, and we breathed it all in. The push and pull of the wind bounced through one open window and out another, brushing through our hair as we began our new adventure. Our first few days of work oriented us around the Reservation and the needs of families, kids, and the greater community. From a patchwork of stories to the history of the people, we observed and listened, realizing that we simply cannot understand the depth of their hearts. It continues to become more real as we interact with the kids during camp. The kids know that Simply Smiles is here for them; the organization’s presence over the past several years is evidence of their deep love. But we still have so much work to do. It was such a simple response, but it raises so many questions. I’m positive this boy meant nothing by it, but it may evidence the very real racism that is still present across North America. Rather than being innately racist, his comment may have been just a statement of reality as he saw it. Its systemic, ingrained presence feels almost as undeniable as the blue of the sky. We still have so much work to do. This is not to say that progress isn’t being made. There are success stories and amazing landmarks that we reach everyday. Perhaps the best example of the love we are witness to is in the genuine laughter of the kids, sometimes at our expense. Many times today, water balloons were broken over our heads, but the momentary surprise and rush of freezing water is well worth the mischievous grins and raucous giggles. We are working toward a better life. This evening, we welcomed several local artisans to the community center to share their talents with us. From handmade bracelets and necklaces, to dream catchers and earrings, we found beauty in their creations and in the creators. To the soundtrack of local drummers, we danced under the South Dakota stars, lightning flashing before us, illuminating the clouds. Behind us, the fiery sunset produced perfect gradients of color. As the drums’ booming faded into the night, quiet conversations with members of the community continued as the bugs began to bite and the crickets sung their song into the darkness. It’s moments like these that confirm our humanity, our reality. There is so much complex and intricate beauty in our world, and so many injustices that pierce our lives, but we must do our part. We are working toward a better life, but we still have so much work to do. This week's Field Note is brought to you by first-time Reservation volunteer Janet Huley. Last night (Sunday), Simply Smiles hosted a large group of families of all ages during its town-wide meal. Teenaged boys and girls flocked to the recently-completed basketball court and divided into teams with mostly the younger interns and volunteers. Parents and grandparents sat down and were eagerly served delicious vegetable pasta with watermelon salad. Some of the ingredients were from the garden and greenhouse behind the big sign that serves as a windbreak and declares to the passing traffic, “La Plant Grows Its Own Food!” One boy asked me suspiciously what the red cubes were in his salad, so I asked him to taste them and tell me if they were a vegetable or a fruit. “Fruit!” he declared. I tried to get him or his brother to sit still for a sketch, but all I could manage were some features before they joined in the games with all the other kids. I got two sisters to sit for their portrait for longer and found that there were many critics their age who would take a look and assure the sister “It doesn’t look like you!” The older sister told me that I didn’t draw very well, so I responded that I was rusty and needed more practice; perhaps after drawing for awhile I would do better. She then offered to draw my portrait, and while drawing she kept saying she wasn’t a good drawer and she didn’t know how. She was very hard on herself. I kept telling her that she should draw what pleases her, and never mind what she thought it should look like - to draw it the way she saw it, and if she liked it, that was the most important thing. Her picture of me was wonderful, with many details like my earrings and clothes. I got to keep her picture of me and in turn, she asked for and I gave her my portraits of her, her sister, and her cousins. I talked with some of the parents and grandparents and some were outgoing and gregarious, while some were shy and reserved. Everyone lingered over the meal, and we discussed the new playground that I could see would really help. Sometimes the younger children are hesitant to join in on basketball with the older kids, and so they need a safe place to play where people can keep a watchful eye on them! Monday began our workday. We had assignments, some of which were geared toward our interests and talents. I was working in designing and implementing a book club sign with several other very talented, creative people. We sketched it out and tried out different designs before finding a suitable piece of wood for the sign and the books we wanted to hang on it. We decided that each book title that the club read would be painted on a little piece of wood with the year, and placed on the sign. We found painting supplies and divided up the work, in addition to priming and painting signs for the vegetable garden. Next to us, my husband, who is also volunteering this week, was working on building a tent for holding music camp. He was in his element working with a team of enthusiastic volunteers digging stakes and assembling this tent that will shade a group of kids on Tuesday. Elsewhere, a group was preparing the ground for the playground, and everyday we share the chores of everyday living. Earlier we toured an almost-finished house, and a house in progress. Inspired by the future, we were told we were going to help unload two new houses - by hand! - to be delivered this week. Summer camp brought back some of the kids we had seen on Sunday, and we were ready with many activities. I couldn’t get anyone to allow me to paint their face, but they did allow me to paint buffalo, suns, basketballs, Minions, and wolves howling at the moon on their hands and arms. In turn, I got a Minion on my hand and some blue faceprint, too. Kids tie-dyed bandanas, decorated treasure boxes, drew with chalk, played beanbags and made friendship bracelets. In the reading nook, I was privileged to have one read a whole book out loud to me.